This page is for all you folks who are completely baffled by the latest lineup of Canon digital Rebel cameras, with three models that (on paper) are virtually identical: the xTi, XS and XSi. In the paragraphs that follow, I'll break down the main differences between each of these three cameras so that you can objectively compare them. The end goal? Hopefully you'll be able to leave this page with a better sense of which Canon digital Rebel is the right one for you. Before we get deep into some comparative analysis of these three cameras, let's find out just how alike they really are. Dimensions 5 x 3.7 x 2.6 in. 127 x 94 x 65mm 5 x 3.9 x 2.6 in. 127 x 99 x 65mm 5.1 x 3.9 x 2.4 in. 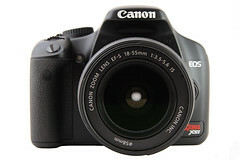 One big commonality - as compared to digital SLRs from other manufacturers is that all of the Canon digital Rebel cameras are incredibly small and light. This is good news for folks who want to carry their SLR around at all times, but it does have a drawback - the reduced size of the grip on these cameras can make them hard to hold, especially if you have large hands or long fingers. Before you make up your mind about any one of these Canon digital Rebels, I'd recommend that you find a camera shop that sells them and hold one in your hand to make sure it's a good fit. If you're the type of person who doesn't enjoy reading a lot of technical analysis, then I'll make this quite simple for you: buy the Canon Rebel XSi. The XSi is the top camera of the three, offering 2 more megapixels, a larger LCD screen and a faster continuous shooting rate. Simply put, the XSi will out-perform the other two Rebels any day of the week. However, not everyone needs the extra speed and megapixels that the XSi has to offer. If you really want to get your money's worth (and don't want to pay for features you won't ever use) then read on. Now let's compare these three Canon digital Rebels in a little more depth. The Rebel xTi is the least expensive of the three, and a lot of that has to do with age: it's also the oldest, originally released in October of 2006. At that time, digital SLRs with live view LCDs weren't the norm as they are now, which is why that feature isn't included on the xTi. Despite the lack of a live view LCD, the xTi is a very capable digital SLR, and captures images with exceptional color and clarity. Like all other Canon digital SLRs, it produces very low noise even at high ISO settings, good news for low-light photographers. The most significant drawback of the camera has nothing to do with the camera itself - it's the kit lens. The kit lens produces sub-par image quality (when compared to other comparable kit lenses for other cameras) and only serves to degrade the Canon xTi's naturally high image quality. The good news here is that now you can purchase the camera body only, and then buy the Rebel XSi kit lens which is a huge improvement. Next up is the Rebel XSi - the high end of the Rebel line - and the reason for talking about this camera second will make sense in just a moment. While there may not be enough in these specifications to cause current xTi owners to upgrade to the latest and greatest, there's a lot of compelling features for the new digital SLR camera buyer here. The XSi remains competitive with other cameras released in 2008, and stands out from the pack (which includes the Nikon D60, Sony A300, Pentax K200D and Olympus E-420) due to it's super-fast 9-point autofocus system and the sharp, colorful images that it captures. If you've been looking for an SLR that's got it all but doesn't feel like toting around a brick then the XSi should be on your short list of cameras to compare (read the complete Canon Rebel XSi Guide. The reason I jumped to the XSi second is because it makes talking about the XS that much easier. 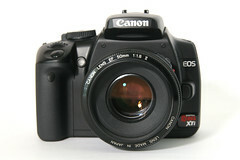 The Rebel XS is positioned directly between the xTi and XSi and is billed as a low-cost "upgrade" to the xTi (while the XSi is clearly a superior camera). Think of the Rebel XS as a blend between the xTi and the XSi. To keep costs down, the XS has a 10 megapixel sensor and only 7 autofocus points (vs. 9 on the XSi). However, to make up for some of the features lacking in the xTi, it includes a dust control system, a live view LCD screen and comes packaged with the Image Stabilized kit lens available with the XSi. Whether you call it a paired-down XSi or an enhanced xTi, the bottom line is this: the XS costs less. If you don't need the bonanza of features available on the XSi, then the XS gets you a camera that's virtually equivalent and saves you about $100. Not to worry - I'm here to help out. There's one last way to compare these Canon digital Rebels that should help you make up your mind once and for all. Rather than tunneling into more technical details, I'm going to match these three different cameras to your photographic needs. Now that we've gotten the commonalities out of the way, let's talk differences. There — did that help? Whether you've made up your mind about which camera to get or still want to evaluate prices (to decide if one REALLY is worth the additional cost), the following links will help you with your comparison shopping.